Born in a small village called Satam, in the region of Kartiphuk of Ngomchu, in eastern Tibet, to a family of devoted yogins, the eighth Karmapa was said to have spoken the words “I am the Karmapa” at birth. Upon hearing this report, Tai Situpa confirmed the child to be the new Karmapa. He spent the next years at Karma Gön. When he was five, a child in Amdo was put forward as the Karmapa. The Karmapa’s regent, Gyaltsab Rinpoche, set out from Tsurphu to investigate the two children. However, on meeting Mikyö Dorje, he found himself spontaneously prostrating and knew that he was the real Karmapa. Gyaltsab Tashi Namgyal and other students of the previous Karmapa, devised a test, which the child not only passed but to which he was heard to say “E ma ho! Have no doubts, I am the Karmapa.” Goshir Gyaltsab Rinpoche enthroned him the following year when he was six. Mikyo Dorje studied with Sangye Nyenpa Tashi Paljor, Dulmo Tashi Öser, Choedrup Senghe and Karma Trinleypa. He took the essential Kagyu teachings from Sangye Nyenpa, Tashi Paljor. The Karmapa received an invitation to China when quite young, but declined on the ground that the Emperor would pass away before he could arrive, a prediction that turned out to be true. Mikyö Dorje was one of the most renowned of the Karmapas, a great meditation master as well as a prolific and learned scholar, author of over thirty volumes of work, including very significant commentaries on the sutrayana treatises and pithy instructions on tantras. The eighth Karmapa was also a visionary artist, to whom we owe the Karma Gadri style of thangka painting- one of the major schools of thangka composition. Mikyo Dorje also composed many sadhanas, practice liturgies, and other devotional practices for the Karma Kagyu school. The eighth Karmapa had many visions of the inseparability of his own manifestations and those of Guru Rinpoche. Guru Rinpoche carries out the activity of the Buddha himself, and is considered one of the ways in which the Buddha accomplishes his enlightened activity. 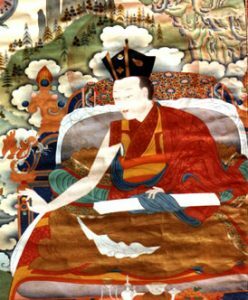 The eighth Karmapa realized his prior manifestation was coincident with the Guru Rinpoche manifestation activity of another historical Buddha, Dipamkara, who according to Buddhist cosmology preceded Buddha Shakyamuni in an era prior to the history of the current era. In Buddhist cosmology, it is said there are to be 1000 such buddhas, and hence the Karmapa and Guru Rinpoche can both be said to be the activity-aspect of all thousand Buddhas of our universe. The present Gyalwang Karmapa has taught many times on Mikyo Dorje’s famous philosophical and tantric texts such as the recent 100 Short Instructions. This and others are available to watch on the YouTube channel.